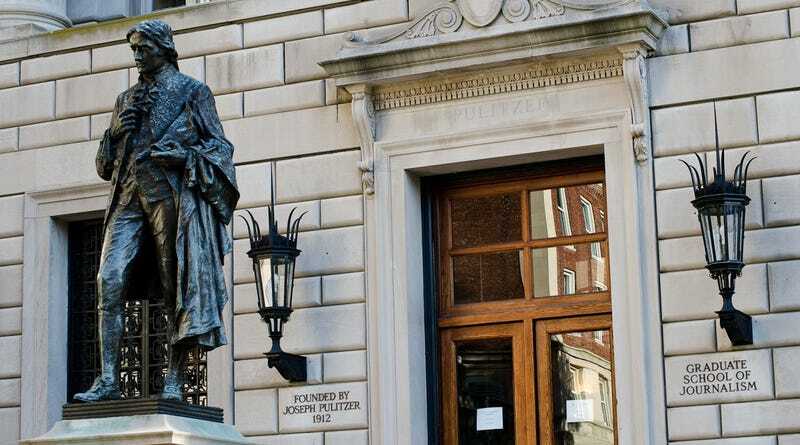 This afternoon, the Columbia Journalism School sent out a mass email to hundreds of media members inviting them and their organizations to register for an upcoming career fair. We are pleased to announce the 2014 Columbia Journalism School Career Expo, Sat., March 29, NYC. Registration is now open for this year's Expo. Please join more than 275 editors, producers and recruiters who help make this event the biggest journalism job fair in the country. Some companies that regularly attend our Expo include ABC News, Agence France Presse, Bloomberg, CBS News, CNN, The Wall Street Journal, Huffington Post, Mashable, NBC, The New York Times, NPR, Time Inc., and The Washington Post. Our Career Expo provides you a chance to spend the day with our 300-plus Master of Science and Master of Arts students – a multilingual, multinational group with diverse life experiences and journalistic interests and skills. You'll meet our Knight-Bagehot Fellows in Business Journalism and students in the Stabile Center for Investigative Journalism. Looking for specialists? Our M.A. students are concentrating on business/financial journalism, arts/culture, science/health and politics. You will also meet students in our Computer Science + Journalism program who are on the cutting edge of data-driven and computational journalism. For a school as steeped in tradition as Columbia, we're happy to tell you that the curriculum has adapted nimbly to the needs of the digital journalism marketplace. In addition to receiving a solid foundation in writing, reporting and ethics, our students are trained in multiplatform reporting, and many specialize in news website design and navigation, social media and SEO, data analysis, data visualization, multimedia production and programming. The Career Expo is heavily underwritten by The Journalism School to keep the price of attending low once again. The cost to register is $125 per news organization for the first two recruiters plus $25 for each additional recruiter. The registration fee covers all costs including a booth, meals, snacks and a resume book. Early bird registration ends on Monday, March 10 at 5 p.m. Registration will be open until Sunday, March 16 at 5 p.m. Please note: If this link takes you to a website security page, please authorize and continue to the survey. We assure you that the site is secure and safe. If you're no longer involved in your company's recruiting efforts, please let us know. For some reason, any email to the Columbia address that sent the original letter went to everyone on the list. This was about the point where you could see the car wreck coming, and there was nothing to do but pray others could see it too. But then, another email, from a research editor at Vogue. Inadvertent reply all meltdowns ALWAYS follow the same sequence. Wave No. 1 is a rush of people asking to be taken off the list. Wave No. 2 is people pointing out that every reply is going to everyone, as if we didn't already know that, and as if that tip didn't clutter things up further. Wave No. 3 is the trolls. For more than an hour and well upwards of 100 emails, the listserv was a disaster area of all that and more. If you'd like to see the entire main chain with names and jobs everything (it broke off into multiple smaller chains as well), that's here. Below, some selected replies in rough chronological order. I have received at least 4 if not 5 emails one after the other on this. Please get the problem under control. please remove me from this list, thanks! Please explain why I'm getting all these emails. I don't have you on a mailing list and have never emailed you. THIS IS OBVIOUSLY A VIRUS. CAN PEOPLE PLEASE REFRAIN FROM ASKING TO BE REMOVED? YOUR REQUESTS ARE GOING OUT TO EVERYONE. JUST STOP AND THE PROBLEM WILL BE SOLVED. I have received at least 8 emails on this along with the others asking to be removed from your mailing. Please correct the problem ASAP!!!!!! 1. Replying "please remove me" won't remove you from the mailing list. 2. It will actively make this whole thing worse. don't want to look dumb, consider this your warning. I'm getting lots of email asking to be removed from the mailing list. Since these emails don't seem to be abating any time soon, why don't you remove all of us and next time use MailChimp or some other service where getting yourself taken off a mailing list doesn't require disturbing everybody else on the list every single time. Can you ask people to stop replying all with their unsubscribe notices, please? This has stopped being annoying and is actually kind of funny now. I speak for myself, obviously. Help. I'm getting emails from everyone on your list. May I humbly suggest that everyone stop sending individual "Please remove me" emails until the folks at Columbia realize that many of us want to be removed and provide us instructions on how to do so? It appears none of us want to be here but we're creating the problem for ourselves. I'm only responding so I can show my friends I made Deadspin. Please don't ever remove me, I'm thoroughly entertained by this. Looks like there was an error somewhere, as I'm sure there are some folks that are not happy about seeing my personal response to this blast email. You guys are all replying to an email LISTSERV, which means it's going out to everyone and their mother on said list. If my phone buzzes one more time I'm going to flush it down the toilet. And I bet that will make my boss really mad. So, if you want off the email chain, I believe the person to contact — DIRECTLY — is Julie Hartenstein. She has been CC'd to this email. And please remove me as well, Ms. Hartenstein. how do I stop receiving all these emails? I think many of us are getting these emails and can't figure out why. Please remove me from list serve. What list are you referring to? I work in the editorial department for U.S. Catholic and not sure if I am the person that you should be sending this to. Please advise so that I can forward your request to the correct person. Since we're all catching up, how y'all doing? Can anyone tell me how to register for the J-School Career Expo? One hour and 18 minutes after the original email was sent out, Columbia set the list to require moderation—no more emails. But we all made a bunch of new friends, and when you really think about it, isn't that what the J-School Career Expo is really all about?